A research team from the University of Texas in Dallas has developed a miniaturized AFM module that will hopefully shrink the price tag while expanding its availability. 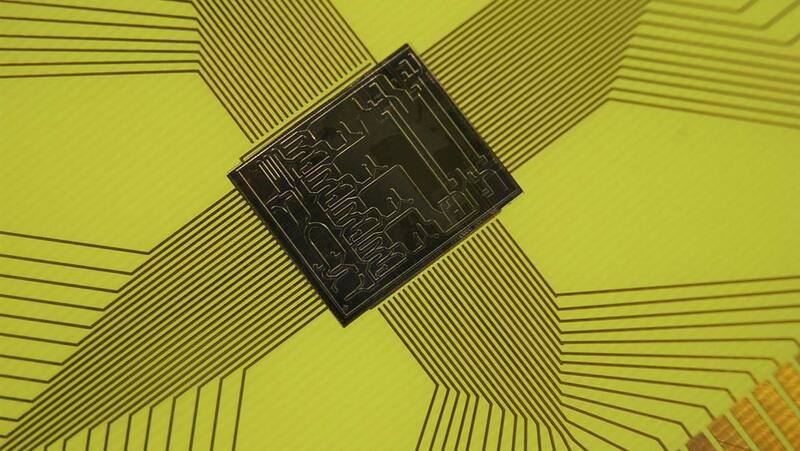 Headed by Dr. Reza Moheimani, professor of mechanical engineering, the team used microelectromechanical systems (MEMS) to create an AFM unit on a chip about the size of a RAM memory stick. Conventional AFM (also known as scanning-force microscopy, SFM) uses a simple cantilever system to obtain a high-resolution surface scan of a sample. The best analogy is the old vinyl records that had a needle sitting in a groove. As the needle is dragged across the surface of the record, the small bumps in the groove are translated as sound. AFM uses this same principle but the probing area is mounted to a piezoelectric crystal that actuates the cantilever and tip across the surface of the sample in a scanning motion. The forces that the cantilever experiences are translated into a high-resolution image of the scanned surface. While developing the MEMS, the team had to incorporate the key components of an AFM into a workable surface of 1 cm2 (smaller than a US dime). Some AFM units use a fixed position arm, which can damage samples or even the probing tip. The MEMS-based AFM uses a tapping mode, where the arm moves up and down as the surfaced is probed. The cantilever never touches the sample, instead, the attractive and repulsive forces between the tip and the sample cause a subtle rise and fall in the cantileer arm. In a conventional AFM, this movement is measured with lasers to provide an image. Once the tapping mode was implemented on the chip, the team needed a method to measure the cantilever arm without using a laser. The team developed a method that would use the piezoelectric crystals as a means of both moving the cantilever arm and measuring the changes caused by surface interactions. Piezoelectric crystals are well-ordered crystals whose cell morphology can be changed by running an electric charge through them. So a constant charge will cause the crystals to vibrate. Conversely, if the crystals are deformed due to an external force like a mounted AFM cantilever, that would translate to a current that can be measured. This allows the team to measure the arm without using a laser. The MEMS-AFM prototype was able to capture a number of AFM images. Initially, the team coupled an optical beam detection system to the chip to measure the cantilever and followed this without the laser. The team found that the system with and without the beam gave comparable images. The onboard sensing system was able to scan an 8 m x 8 m grid with a depth change of 50 nm. As a proof of concept experiment, the MEMS-AFM performed exceptionally well, though the cantilever tip did experience wear and thus was slightly degraded. MEMS technology is nothing new; it is the same technology that you find in smartphones. What is unique is how the field is expanding and changing. New ideas are slowly being incorporated into MEMS systems and if they take off, they can be mass produced quickly and inexpensively. What could you use a pocket size AFM for? Many industries rely on materials science to ensure the quality of their high-performance parts, like car or jet engines. These machines suffer from metal fatigue upon extended uses, which could lead to catastrophe. Microcracks are the first sign of imminent failure and having a handheld surface scanning tool could prevent a disaster.